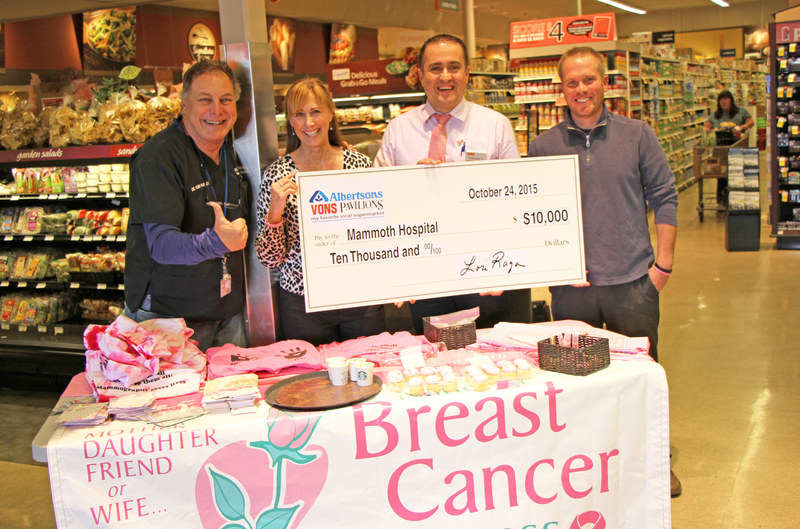 In support of National Breast Cancer Awareness Month, Mammoth Hospital Foundation and The Vons Foundation partnered to raise $10,000 for Mammoth Hospital’s Breast Care Fund. All donations will help underprivileged women of Inyo and Mono Counties pay for mammograms as part of Mammoth Hospital’s Breast Care Fund. This was the third year that Mammoth Hospital and Vons have collaborated for the cause. Yuri Parisky, M.D., Medical Imaging Director at Mammoth Hospital is very grateful to the Vons Foundation in generously supporting the Breast Care Fund for the last few years. “The Vons Foundation has again demonstrated its commitment to this community by keeping it local, and supporting Mammoth Hospital in its vigilance against Breast Cancer,” said Parisky. To show your support for Breast Cancer and the Breast Care Fund serving the underprivileged women in Inyo and Mono Counties, contact Bubby Greene, Mammoth Hospital Marketing/Foundation Coordinator at (760) 924-4128.